I'm an IBM Security Access Manager customer. Does Cloud Identity work with ISAM? Yes, Cloud Identity and ISAM are jointly entitled and work together seamlessly. You can enable a Cloud Identity subscription directly from your administrative console. For more information on integration scenarios, read the datasheet. Can I protect my on-premise applications with Cloud Identity? Yes, IBM Cloud Identity works hand in hand with IBM Security Access Manager to protect older authentication protocols. In fact, IBM Security Access Manager is included with a purchase of Cloud Identity Connect at no extra charge. Can I use Cloud Identity for customers and for employees? Cloud Identity can be utilized to support both customer or consumer (cloud directory and social authentication) use cases as well as employee single sign on use cases, all within one unified platform. Does Cloud Identity provide consent management for applications? In applications that support OpenID Connect and OAuth2, consent management can be easily enabled so users are prompted to provide permission before granting authorization to that application. What's included in the Free Edition of Cloud Identity? The Cloud Identity Free Edition allows for up to 5 applications to be onboarded using SAML2.0, OpenID Connect, or OAuth2 clients, without expiration, allowing organizations to try the full CI platform without interruption. What is the Service Level Agreement for Cloud Identity? Cloud Identity's availability has 99.9% uptime guaranteed. 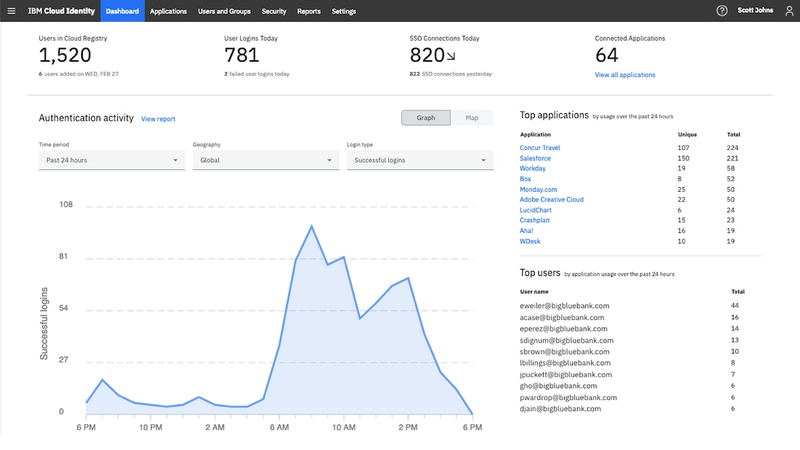 Customers can monitor the uptime of the Cloud Identity service here. How can I use Active Directory as an identity source with Cloud Identity? Details on how to use Active Directory as an identity source can be found here. Where is the Service Description for Cloud Identity? The Cloud Identity service description can be found here. What security certifications does Cloud Identity have? Up to date certifications for IBM Cloud Identity can be found here. How does Cloud Identity support multi factor authentication for VPNs? IBM Cloud Identity includes a RADIUS client that can serve as an authentication mechanism for VPN connections and other systems that support the RADIUS protocol. You can download the Linux PAM installation files here. What user authentication methods does Cloud Identity offer? Cloud Identity offers time-based one-time passwords (TOTP), email one-time passwords (Email OTP), SMS one-time passwords (SMS OTP), and the IBM Verify Mobile Multi-Factor Authenticator for mobile push notifications. Does Cloud Identity support SCIM for user provisioning? Yes, IBM Cloud Identity supports user provisioning APIs that follow SCIM. How can I learn how to use Cloud Identity? Launch the interactive demo for a step by step walk through, or get more detailed implementation techniques at the Security Learning Academy. Does Cloud Identity provide out of the box SDKs for development? Yes, we have SDKs for various use cases, such as native mobile applications, and web applications using frameworks like NodeJS and ReactJS. Visit the Developer Portal to learn more.